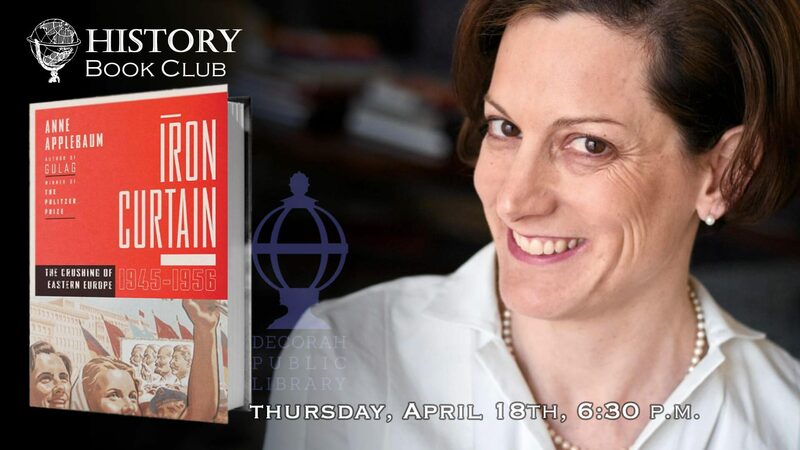 The History Book Group will discuss Anne Applebaum’s “Iron Curtain: The Crushing of Eastern Europe 1944-1956” at 6:30 p.m. Thurs. April 18th on the 2nd floor of the library. In “Iron Curtain,” Pulitzer Prize-winning journalist Anne Applebaum describes how the Communist regimes of Eastern Europe were created and what daily life was like once they were complete. She draws on newly opened East European archives, interviews, and personal accounts translated for the first time to portray the dilemmas faced by millions of individuals trying to adjust to a way of life that challenged their every belief and took away everything they had accumulated.